I've had the pleasure of working with multiple Bay Area communities in the mission to spread yoga and make it more accessible to everyone. Currently, I am partnering with Prana SF to offer free and accessible yoga to the Bay Area yoga community. In addition, I am also one of their product influencers. In collaboration with Lululemon, I’ve hosted all-levels community classes at San Francisco's Cow Hollow location. I've also joined with their partnering store Ivivva, teaching to girls ages 6-10 in Corte Madera, CA. Based in San Francisco, RISE Yoga for Youth is a non-profit that hosts a yearly fundraiser to support yoga programs within Bay Area schools. I've coordinated with the organization in promotional services for this annual "Yogathon" event. I've had the opportunity to travel with San Francisco's Purusha yoga studio in a service and cultural-based expedition to Nepal. 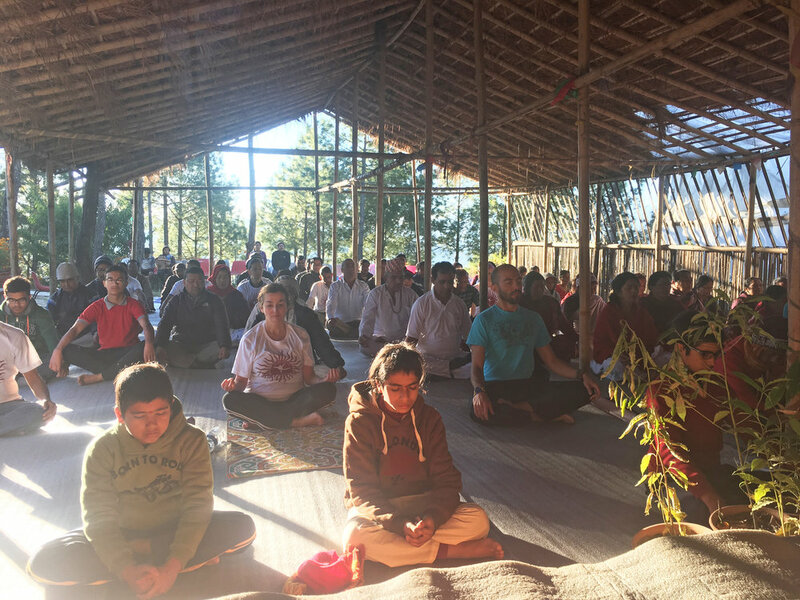 I was privileged to teach to the Dhulikhel community in a yoga and holistic health camp. I spoke to the HVP Thali students and teachers on what is means to be a yoga teacher in American, in addition to leading a Sun Salutation overview to the Kathmandu University students and faculty. I am currently partnering with WITHIN SF to offer accessible mindfulness and meditation instruction to all-levels of practitioners. In association with WITHIN SF, I’ve had the pleasure and privilege to lead a guided meditation at their Brain & Body Nightlife events. It has been an honor to work with talented musicians in various capacities to bring a beautiful complement to yoga through music. The power of live music while practicing asana or perfecting the rhythms and tones to make for a blissful Savasana, is truly a gift to the practice. Thank you to these creative spirits who have accompanied me in these collaborations and shared their skillful craft with us. Gabriel is a notably talented and intuitive artist. I've had the pleasure of working with him on multiple occasions through workshops and retreat. He provides an immense amount of depth to his skill and I'm always amazed by how many instruments he has mastered! He has a way of tuning deeply into the teacher's sequence and responding seamlessly through his delivery. Thank you for your masterful expressions Gabriel. More about the artist: He currently tours internationally, performing with his mother, famed folk musician Joan Baez. He has performed on stage with the likes of The Grateful Dead, Carlos Santana, Mickey Hart, Indigo Girls, Babatunde Olatunji, Pete Escovedo's Latin Jazz Ensemble, and many more. Gabriel performs and records with a variety of ensembles and singer-songwriters in the Bay Area, and is available to hire as an accompanist, solo artist, or for recording. I've also had the pleasure of collaborating with talented instrumentalist Aroshanti. This artistic clearly has a love and passion for music that translates into his diverse and beautiful compositions. I was lucky enough to have been asked by him to support his explorations through offering musical guidance/suggestions towards his more recent work. Through this collaboration (at a distance), it has been fulfilling to propose ideas that may further enhance yoga-centric music. Being a former pianist myself, I am grateful to exercise my sense of musicality in this way. Thank you for your inspiration Aroshanti. “As I learn more about sound and music the more amazed I am about the world we live in. The more I develop my spiritual being the more inspired I am to compose music and play with sound. For inquiries about collaborative efforts and projects, please share some details below. Remember that consciousness is power.